Another "effects" module, the Synthasystem Ring Mod features a wet-dry crossfade like the Phase Shifter. Like many modular ring modulators, it isn't a "true" ring modular: there's no diode ring. 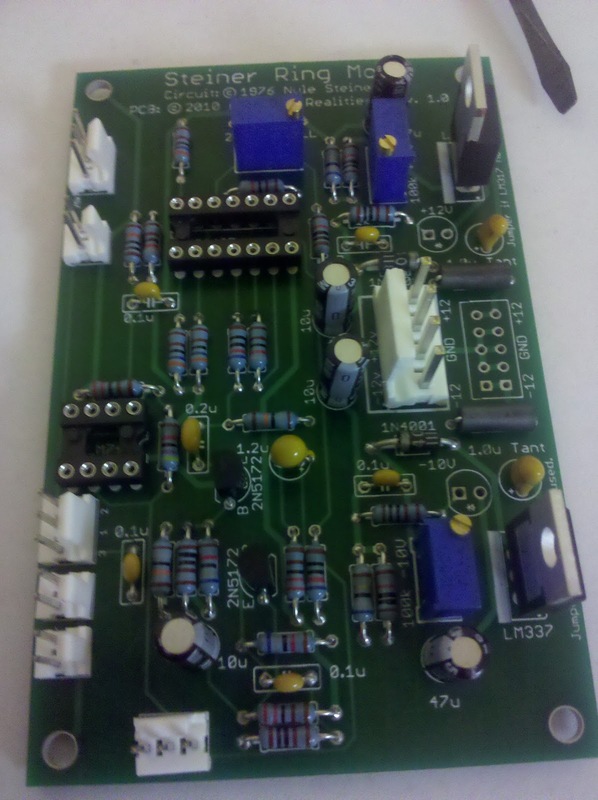 Instead, it uses an MC1495 Four Quadrant Multiplier IC. This is, in fact, the only "specialty" chip found within the entire Synthasystem! All the other ICs are either purely opamps or matched transistor pairs. Besides the wet-dry crossfade, this has another interesting feature: there's a switch (Multiply/Square) to send the input signal to the carrier input as well. When this "square" mode is enabled, it theoretically doubles the frequency, but apparently does some more interesting distortion too (especially for audio signals). I still need to install the chips, but it is another straightforward build. There's a 1.2u electrolytic capacitor which (due to unavailability) I've replaced with a tantalum cap. There's also two trimpots (besides the power ones): the Signal Null (on the PCB), and the Carrier Null, which is a panel-mounted trimpot like on the oscillators. I've also just ordered the panels and panel parts for this, the Phase Shifter, the Peak Selector, and the Noise.